Mirror, mirror on the wall, who’s the doomiest of them all? If the Magic Mirror knows what the game is all about, it shouldn’t be difficult for it to point to Hooded Menace. The lakes, woods, caves and graves of Finland where the Eyeless Horde lives are also home to the filthiest creation of extreme doom metal that the world was punished by in the last couple of years. 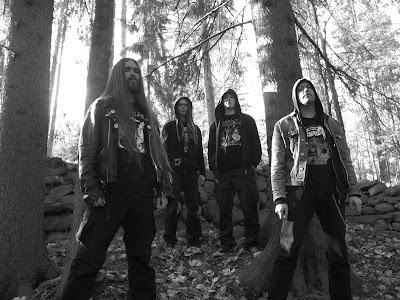 Two gargantuan albums, “Fulfill the Curse” (2008) and “Never Cross the Dead” (2010), exterminated most of the potential competition with the outstanding style of their old school song-writing, horror-worship and crushing heaviness and groove. 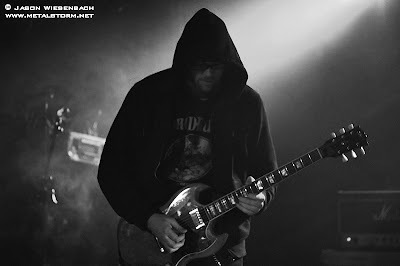 The band’s mastermind Lasse Pyykkö, who is absolutely no newcomer to metal, having been involved before in such groups as Phlegethon, Acid Witch or Vacant Coffin, talks about the reality of doom. Doom metal is sometimes understood as a state of mind. What emotions and events drove you to the point where you created Hooded Menace? Lasse: Simply the need to play something crushingly heavy and slow stuff led to the birth of Hooded Menace. I have always dug the rugged and forlorn vibe of doom. I craved to play some slow heavy stuff that oozes thick atmosphere and melts your face off. Not to forget good compositions... real songs. Hooded Menace was formed in 2007 and it's a relatively young band. Did you have any basic ideas for its sound in your head for years before 2007? Lasse: I guess the basic ideas have been hiding in the back of my brain for many years actually. A few riffs on "Fulfill the Curse" are taken from the songs I wrote for Phlegethon "Promo 95". If I had formed Hooded Menace say sometime in the 90's I don't think the compositions would have been much different. Candlemass, Paradise Lost, Autopsy... that's what I grew up with and that's definitely where I would have drawn the influences from if I had a death/doom band. Phlegethon had a little bit of these influences. Hooded Menace artworks are top-notch. You take good care of the way your records and merch look. Who are you co-operating with on that matter? Lasse: Thanks! We have been working with artists such as Putrid, Eric Engelmann, Rafal Kruszyk, Daniel Desecrator, Justin Bartlett, Adam Geyer, Daniel Devilish... It's really important to us to have a decent design for everything we put out. Good art belongs to good heavy metal. The art already creates a certain kind of atmosphere around the band. The artists we work with "get" what Hooded Menace are all about so working with them is easy. Playing very fast blastbeats and breakdowns is naturally, physically difficult. Is playing very slow difficult too? Maybe it is, but in a different way? Lasse: Yeah, in a different way... it can be a bit difficult for a band to hit the notes exactly at the same time at really slow tempos. It's easier to hear if you miss a note in doom than if you miss a note in grindcore. I'm not saying that it needs to be "perfect" but I like our songs pretty tight. Surely this is not music for players who want to go for crazy solos and drum fills and stuff like that just to show off. This needs a different kind of approach really. It's about real songs and the crushing weight of sound produced by a few guys playing together as a solid unit. You started Phlegethon at the age of 14. How did it all happen? What was the main inspiration? Did you have a clue how to play? Lasse: We were a bunch of kids into fast and heavy music. All of us had been playing instruments for some time already before forming the band. Bands like Slayer and Death were probably the most important to us at the beginning but of course there were others also such as Kreator, Sepultura, Coroner, Bathory, Sacrifice... Actually we did have a clue how to play and I guess we were pretty okay players for our own age. You released „Visio Dei Beatifica”, your first Phlegethon demo in 1989. That was only a year after Darkthrone's first demo „Land of Frost”. Back in the day, did you know their records, were you in touch with them? Lasse: I don't think we knew Darkthrone when we put out our first demo but of course very soon we would and did. The first Darkthrone stuff I heard was the "Cromlech" tape that Teemu (our contact guy back in the day) bought/traded from somewhere. As far as I remember we weren't in contact with Darkthrone at the time. "Cromlech" blew me away and I was really looking forward to their debut album and picked up "Soulside Journey" fresh from the print. Great album indeed. Very impressive and cool drumming from Fenriz and some awesome doomy moments also. I'd say you can hear a little bit of that early Darkthrone influence in Hooded Menace. In Claws, you handle all the instruments including drums, guitar, bass and vocal duties. Are you that talented or didn't you want to bother finding anyone who's up to playing with you? Lasse: I bought a new drum kit (I had sold the old kit years ago) a few years back, had fun playing and soon thought that maybe I should record an album and play all the instruments by myself. So I went for this really raw and ugly death metal solo project called Claws. I don´t regard myself as an "multi-instrumentalist" as I can play drums and guitar only. I'm not even that great a drummer, guitarist or vocalist but I knew I was good enough to handle everything in Claws. It was supposed to be really raw and a little bit of sloppiness wasn't going to bother me. The album and the 7" came out really cool so I'm happy I decided to go solo. What is your favourite instrument? Which was the first one? Which one do you practice the most often? Lasse: I write the songs on guitar so that's definitely my favourite instrument. An acoustic guitar was my first instrument. I don't practice actually. Well, before the Claws project I practiced drums a bit because I was horribly rusty. I learned guitar by writing songs basically. I never practiced scales or any of that boring stuff. If you had to choose one movie, would it be „The Exorcist” or „Omen” and why? Lasse: I like them both but I'll go with "The Exorcist". It's creepier and grosser. The soundtrack is killer too. You have left Acid Witch. What's the history behind that band and why do you no longer participate? Lasse: Dave formed Acid Witch sometime in 2007. At first he only had some instrumental tunes on Acid Witch myspace and I told him I liked what he had there. He liked the idea of getting someone to growl to his songs and the next thing I knew I was in the band. I left Acid Witch because I wanted to focus on my own bands. You know, Acid Witch is Dave's brainchild and he writes the music. I was "just" a singer. I guess I simply got a bit tired of singing the stuff. They also wanted to start playing gigs and that could not happen with me as I live in Finland and the rest of the guys are in the US. Now with Dave on vocals they sound just as good as ever. Actually I think Dave's vocals fit better to Acid Witch than mine. Sweden has got Nihilist, Dismember, Entombed. Norway has got Mayhem, Darkthrone, Satyricon. What bands and what people were the most important to the Finnish metal scene in the early stages? Lasse: Tapetraders like Luxi and Jami Lahtinen were active and significant characters in the scene. Also “Isten” mag needs to be mentioned. 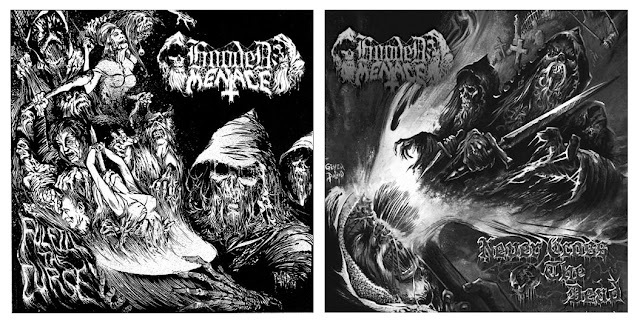 As for the important, early death metal bands, there was Funebre, Xysma (not really death metal but one of the most momentous bands in the scene) and Abhorrence. Soon Sentenced, Amorphis, Demigod and others followed. What was really cool back in the day was that the bands had their own individual sound. Everything was exciting and small... pretty much everyone knew each other and played with each other. Indeed, some unforgettable death metal was created during those early years in Finland. Late birds who missed those early days and are now in their mid-30's or something raving about how "real" and "by the book" their bands are make me laugh. Don't get me wrong, I think it's great that more bands play "old school" metal but I don't get what all that loud mouthing is about. In my opinion, it only shows how uncertain these people are in fact. Finland has popular bands such as Amorphis, Children of Bodom, Rotten Sound and Impaled Nazarene, but compared to Sweden or Norway the scene seems to be really small. How does it look from your perspective? Lasse: I don't follow these things too much. But yeah I guess the Swedish scene is a bit bigger as it has always been, but Norway and Finland are pretty fifty-fifty. Maybe they have more black metal in Norway or at least they are more known for it, but we have more death metal in Finland. That's the impression I have got. Not that it matters to me though. Anyway in Finland metal is huge. A phenomenon... a folk music really. So kids are excited and encouraged to start metal bands, more gigs are arranged and so forth. Of course this spawns a lot of crap but there can always be a few diamonds among the garbage.